This is a Magnificent new Viking painting "Frey and Surtr at Ragnarok". This is a superb painting from the Ragnarok series of paintings. 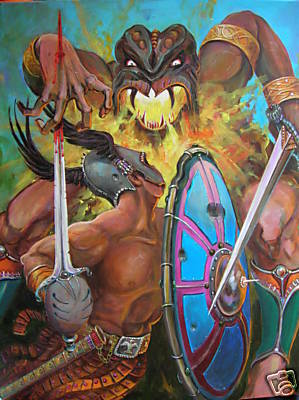 In this terrifying painting at the end of the world, Freyr attacks the fire giant Surtr. Freyr knew that it would be impossible to beat Surtr or the "black one" as this enormous giant incinerated all around him. Despite this Freyr launches his savage suicidal attack and is killed! Surtr is an important giant in Norse mythology even to this day. For example when a volcanic explosion ripped out of the sea off the coast of Iceland, the Icelander's called the island that formed - Surtsey. (Surtr's island) ................................................ BY THE SUPERB GOODMAN WHO IS AN ACCOMPLISHED ARTIST HAVING BEEN A FINALIST AT THE GARRICK-MILNE PRIZE.HE HAS MANY OF HIS WORKS SOLD AT CHRISTIES. Asgard Arts offers works of art which will not only look fantastic in your home or offices (One Investment Bank in particular has purchased paintings from us for their offices see Bull paintings) but will also be a sound financial investment for the future. Art has long been regarded as a strong and safe investment. Investment in paintings was discussed recently on Bloomberg television as a sound investment as a hard asset like Gold, Platinum Silver etc. Also Ellen Kelleher a personal finance journalist for The Financial Times recently wrote an article recommending the purchase of Art, particularly in the $500 - $50,000 range as a sound long term investment with an impressive current average annual increase of 9.7 percent. Go to Latest Art news on Asgard Arts and seeHang your investments on the wall by Ellen Kelleher Published October 22 2010 in the Financial Times.